National Holidays: 21 July. A major non-official holiday is the Saint Nicholas Day, a festivity for children. 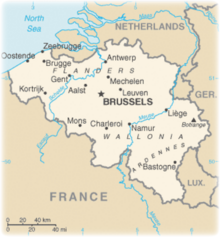 Additional Info: Folklore plays a major role in Belgium's cultural life, the country has a comparatively high number of festivals. Bikers will love what Belgium offers with its rolling hills of Wallonia, and flatlands of Flanders, there are miles of cycleways along canals and winding through small towns and villages and past historic castles. It's probably the best way to see Belgium. 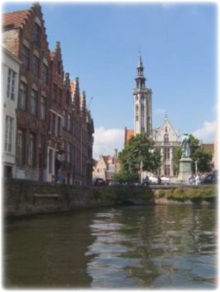 Waterways and coast of Belgium: try taking a tour that includes the Flanders region through historic towns and wonderful countryside, including such historic towns as Bruges, Ostende and Leper. This will take you on quiet country lanes, cycleways and canal paths. It is a good opportunity to experience wonderful countryside, sand dunes, canals and the coast . Belgium provides a great rich architecture of churches, monasteries, windmills and castles. The famous medieval towns of Leper, Poperinge, Diksmunde and Bruges. And with all that cycling during the day, you can enjoy the great beer drinking atmosphere in the pubs. Try starting at Roeselare and do a circular route to Kemmel, Fiksmuide, Bruges, Knokke and back to Roeselare for a 160 mile 6-7 day trip or longer. Brussels to Bruges: try a beautiful cycling tour from the capital Brussels to the historic town of Bruges. A relatively easy tour, this can be completed in 6-7 days. Flanders and Europe's capital Brussels offer a holiday joy for everybody, lovely bike tours through beautiful landscapes, culinary joy in great restaurants, cultural highlights in historical buildings and museums and of course the ever pulsating city of Brussels.